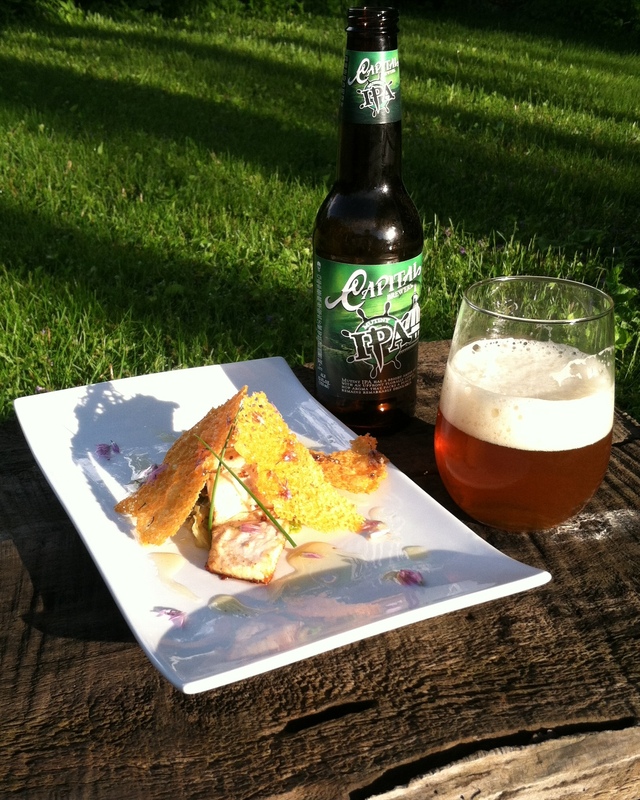 We have a nice stock of Capitol Brewery’s Mutiny IPA and wanted to pair it with Lake Superior Whitefish fillets. A simple fish fry is a perfect combination and a great touchstone of Great Lakes Cuisine but we were looking for something a bit…well, a bit different. Instead of the traditional coleslaw, we went with a thinly sliced Savoy cabbage, sauteed over high heat with butter. In the Milwaukee area, a potato pancake is traditional. We considered a rice cake, which we’ve done in the past out of leftover risotto. 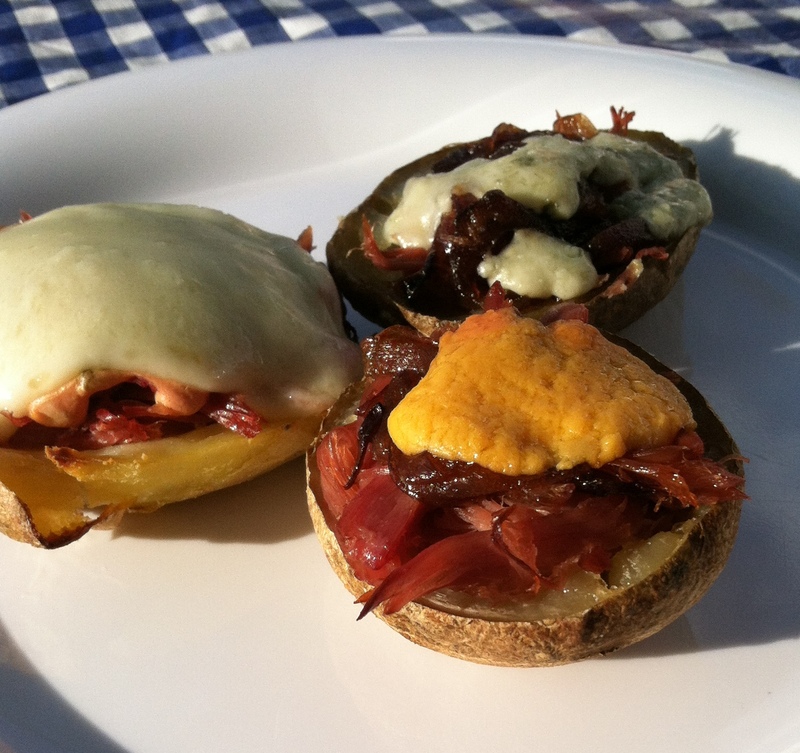 Wanted something lighter – How about a cheddar crisp? 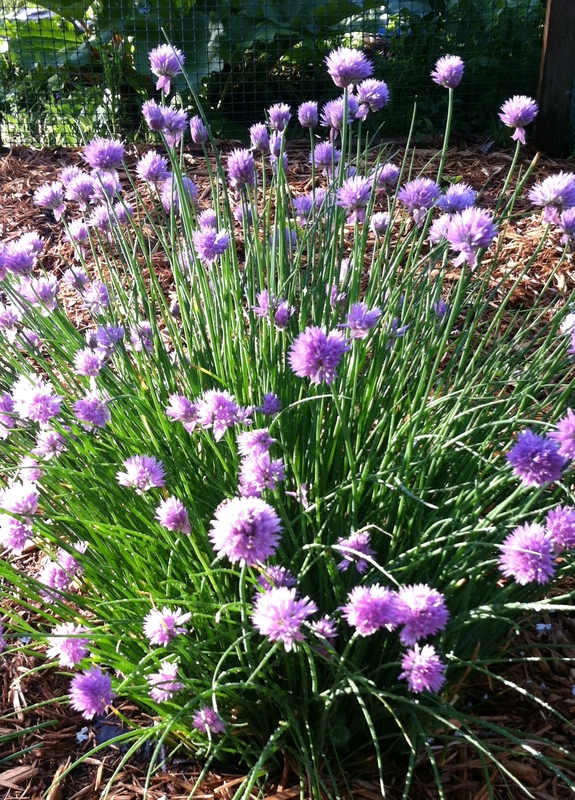 The garlic chives are in full-bloom in the garden and that would be the perfect accent. In a large pan over high heat, we placed crumbled 6 year old white cheddar, cooked until it began to brown noticeably on the edges then added chive flowers. The cheddar yields an oil in the process not unlike clarified butter which we saved. The cheddar crisp was allowed to cool and had a pleasant bitterness from the aged cheddar and a bit of pepper from the chive flower. the fish was cooked in large pan over medium high heat in butter, skin side down until finished. The cheddar crisp mimics the look and texture of a perfect fish fry coating, but the flavors pop and provide a perfect foil for the rich fish. The cabbage brings a nice vegetal quality to the dish and provides a base of flavors for the Mutiny IPA to play against. We added additional chive flowers and the clarified cheddar oil around the plate. Capitol Brewery’s Mutiny IPA has a nice malt/hop balance which makes it a perfect beer on a beautiful summer evening. From Friday Fish Fry to whitefish with chive/cheddar crisp – inspiration and combinations are what Great Lakes Cuisine is all about. Enjoy. So we’re on a bit of a smoked duck kick of late based on a gift we received of three whole smoked ducks. We covered the process of breaking the duck down into parts in our Smoked Duck Pot Pie discussion, and now we return to those pieces for a few additional applications. 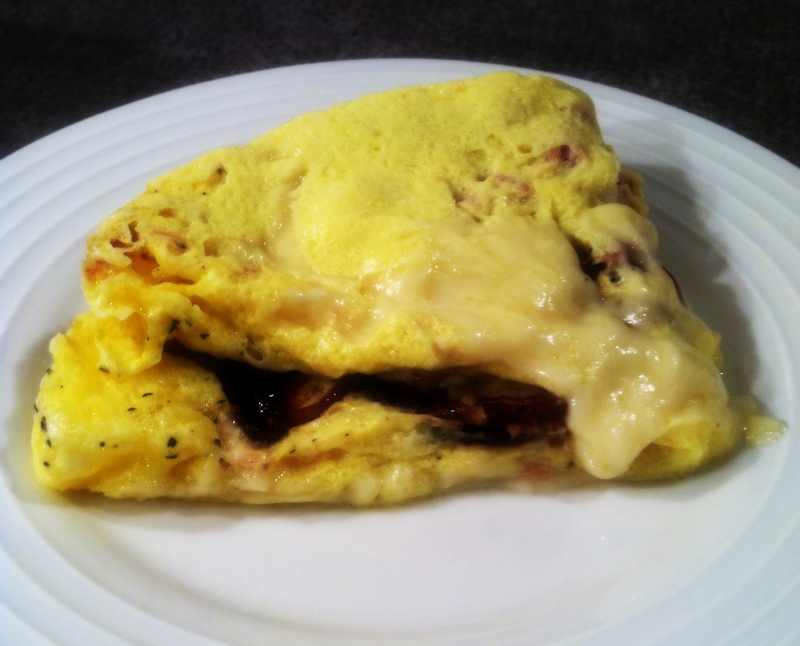 The shredded duck and some tangy, caramelized onions were married with baby swiss in a simple omelet. The duck confit with brie in a crepe has been a standard offering at La Reve in Wauwatosa, WI for many years and is a favorite lunch dish. This echoed those same flavors. Sort of like ultimate duck fat fries…ah, mon chéri! Using crushed pretzels as the coating for a pork schnitzel adds a nice texture to the coating. The flour, egg, pretzel sequence of coating, as well as allowing the coating to rest for five minutes before frying, ensures better adherence. The spaetzle gets an addition of New Glarus Totally Naked in place of milk or eggs, and the result is a bit lighter with just a slight overtone of the flavors in the beer. Totally Naked is a very lovely, and very light, beer. This seems to be an experiment worth revisiting with darker, bolder beers and perhaps whole wheat flours or other alternative grains. 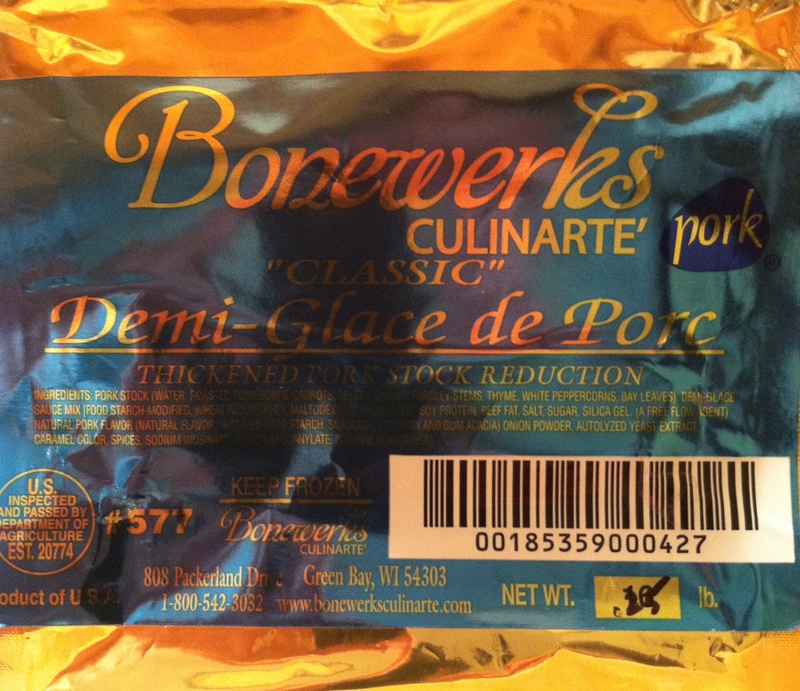 We used a new product in the sauce – Bonewerks Culinarte’ Demi-Glace de Porc. It is a thicken, reduced pork stock from their kitchen in Green Bay, WI. Their products are well made and a great “cheater” on a dish or sauce if you don’t have a long simmered pork broth on hand at the time – super convenient. The other flavors in the sauce are intended to echo those in sauerbraten, which in some traditional recipes includes crushed gingersnap cookies. We recommend using craft brew vinegar for the sauce, such as the American Amber from Milwaukee Craft Foods, but apple cider vinegar is a workable substitute. Note: This is pork loin, not tenderloin. 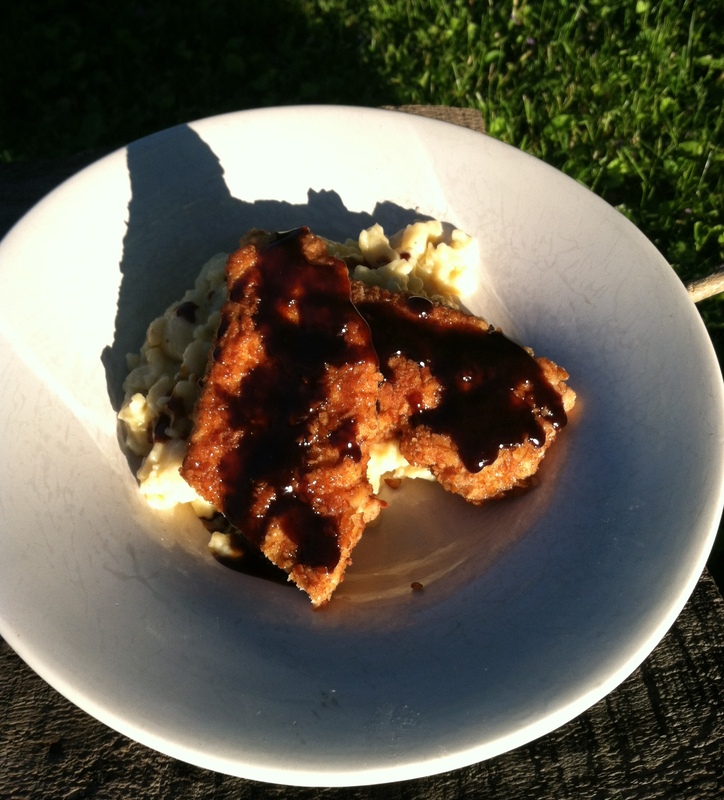 This is often sold as boneless pork chops, which is the loin cut into 1 inch steaks. If purchased as a full loin, cut into 1-inch pieces across the grain, and then place each piece inside a plastic freezer bag and use a meat mallet to pound the pieces until 1/4 inch thick. Sprinkle each piece with flour to coat lightly, but completely. Mix the eggs and milk together in a shallow, wide bowl. Spread the pretzels in a sheet pan. Dip each piece fully in the egg mixture and then press both sides into pretzel mixture to coat well. Set aside for 5 minutes. Over medium high heat, heat canola oil in a large cast iron pan. Oil should be approximately ¼ inch high on the sides of the pan. When oil shimmers, but is not smoking, add pork. It should immediately begin to sizzle. Work in batches and do not crowd pan. Pieces should fit in one layer with some spacing around them. Allow to cook until a golden brown, slightly darker than corn flakes. Turn over to complete cooking. Remove pieces as they finish to a draining rack set over a sheet pan in the oven to stay warm as you complete the remaining pieces. Note: we used New Glarus Totally Naked for our dumplings, a lighter offering from the folks at New Glarus, but only available in Wisconsin. Nearly any beer will work in this application based on your flavor preference. In a large pot over high heat, bring broth to a boil then reduce to a simmer. Mix remaining ingredients in a large bowl. Dough should be slightly thicker than pancake batter with some elasticity. Over the simmer broth, working in batches, force the dough through a spaetzle maker, a colander with holes, or a spoon with holes. As the dough falls into the pot, it will cook into irregular shaped dumplings. They will float to the surface, or give a light stir until they do. Cook for 3 minutes then strain out with a slotted spoon, and layer onto a sheet pan while completing the remainder of the dough. Heat butter in a large sauté pan over medium high heat, and when foam subsides, working in batches as to not crowd the pan, toss the spaetzle until just slight browning appears on edges. Serve immediately. Place all ingredients in a large sauté pan over medium high heat and reduce until as thick as maple syrup.